One of the classics I must have missed in high school. A timeless story, however, which should be read at any age or stage of life. It's such a transparent allegory of the Bolshevik Revolution and the ensuing years of Leninist terror (e.g., the use of 'comrade' throughout and the lead pig named, of course, Napoleon, a symbol of tyranny) that it reads almost like history, despite the zoomorphism and fantastical premise of animals running a farm. And yet, it's not an allegory. Orwell subtitled this piece, "A Fairy Story." And that's about right. The story, like all good fairy stories, transcends time and context and simply "tells it like it is" without moral comment. 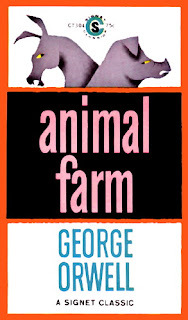 I think it's obvious this is a story about totalitarianism (Orwell was a strong critic of the ideology) but Animal Farm doesn't so much condemn it as expresses it in its logical extreme - and let's the truth of the matter hit the reader full force. The most compelling "truth" of totalitarianism comes near the climax, the famous observation that all animals are equal but some animals are more equal than others. Hnh, boy. One application for today is poignant. The regressive left (with roots in the sexual revolution of the 1960s) has overthrown what they think is the tsarist autocracy of Christendom (in their minds equal to white male privilege) and declared all genders, gender identities, gender expressions, etc. equal. "Multi-sexes good, two sexes bad." But what the regressive left has done is simply established a new totalitarianism in which all dissent is quashed and thoughts are censored. Well, there's more to say but that's probably enough to show I recommend this book today, especially for leftist leaning teachers of high school lit. I only hope they see the irony of the message they want to discuss.